Spring has finally arrived! Made the trip down to Winding Trails under beautiful blue skies for my first ride without long sleeves and leg warmers. Course is fast and twisty (it is called Winding Trails after all) similar to KP, mostly hardpack except for a few corners worn loose from race traffic and just enough mud to crud up the bike and shoes. Spirits were high throughout the venue as we rejoiced what seems to finally be the end of winter. I used this race to mostly see how effective the winter training was and to get that first race effort under the belt. The Cat 1 race was 4 laps on a 5 mile loop with 4 short punchy climbs per lap. I started about mid pack knowing there was ample time and room for passing throughout the 20 mile race. Shortly after the start, like 2 minutes we faced the steepest punchy climb and I was forced to dismount as traffic in front, not unsurprisingly, stalled out. After a quick run to the top I was back on the pedals and settled into a good threshold rhythm for about the next 50 minutes. As the third lap began I noticed the first chink in my nearly exclusive indoor winter trainer sessions, not enough efforts beyond 40 minutes yet. The high end was there but the sustainability not so much. I put down a GU and turned the throttle down just a bit. About half a lap later the legs started to come around and with the knowledge of having only one lap left I turned the gas back to high. With all of the traffic of multiple categories I had little idea where I stood as far as placing and didn't have anyone in particular to chase down. Instead I was determined to not let anyone come around me and happy to know I was riding to my limit as I began to cramp with any out of the saddle efforts. I ended up finishing 8th out of 30. 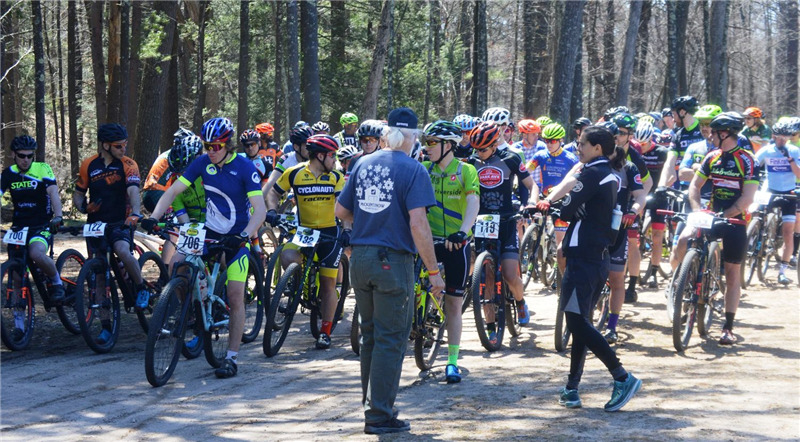 Placed in the top ten, obtained good training feedback, and had a blast riding mountain bikes on a beautiful spring day! Excellent start to what I hope is an excellent season!